The Wine Spectator’s Top 100 list was recently released and on it, to our delight, was not one, but TWO Austrian wine producers. 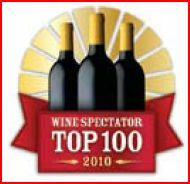 Special congratulations to Weingut Stadt Krems and Weingut Knoll for each earning a spot in Wine Spectator’s Top 100 Wines of 2010. Weingut Stadt Krems: #93 scored 90 points, retails for $16: Stadt Krems Grüner Veltliner Qualitätswein Trocken Kremstal 2008. These two expressions of Gruener Veltliner differ somewhat, but that just goes to show what a crowd pleaser GV can be! So for this Thanksgiving, why not pair your turkey with these two great Austrian wines? We’d love to hear about it!